You heard us right. Flexsteel is bringing back one of the most iconic sofas we’ve ever created…the Thunderbird Sofa. As part of our celebration of 125 years in business we’ve decided to update and reintroduce this mid-century modern classic. Mid-Century Modern refers to the furniture designed in the 50s and 60s. The term was actually coined by author Cara Greenberg in 1983 in her book, Midcentury Modern: Furniture of the 1950s. The focus of modernist furniture is to create something clean, light and functional with smart use of materials. Mid-Century Modern furniture is more popular today than ever before because it’s versatile and perfect for small spaces. It goes with everything! With housing trends becoming more urban, it just makes sense to resurrect the beauty and functionality of the Thunderbird Sofa. The Thunderbird Sofa was a classic in the 60s. It competed with architectural giants like Adrian Pearsall. Architecturally, the Thunderbird Sofa is very futuristic looking. 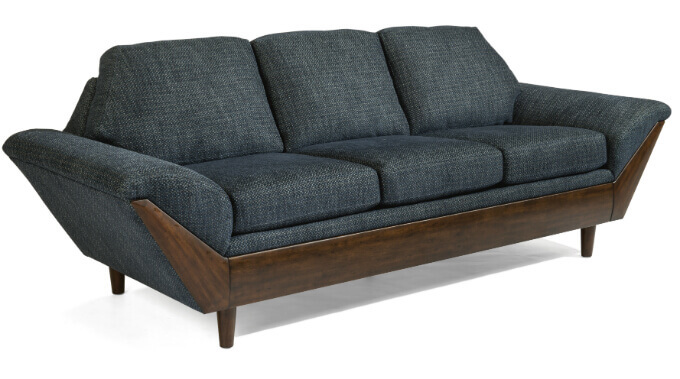 The beautifully-crafted wood frame is as much a part of the design as the v-shaped cushions. It’s the kind of sofa Don Draper would have had in his penthouse apartment because like him, the Thunderbird Sofa made a statement. When Flexsteel’s designers set out to update the design they didn’t want to lose the beauty of the frame, but they also knew that the original length of 115 inches would pose a problem for many of today’s buyers. So, they shortened it to 101 inches long and made some changes to the type of wood used on the frame. The frame on the new Thunderbird Sofa is now constructed of more environmentally-friendly rubber wood stained in a walnut color to match the original design. 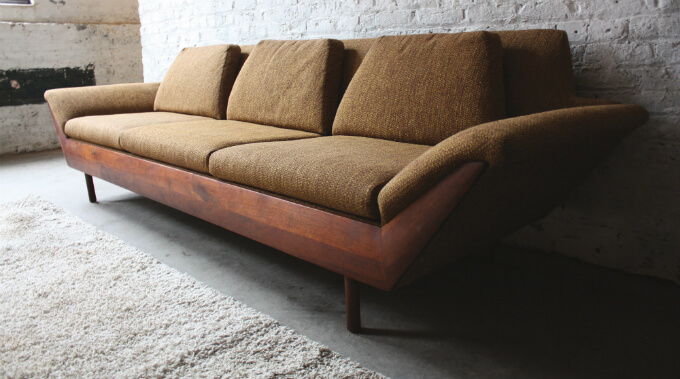 The Thunderbird is and an ode to Flexsteel’s iconic mid-1960s Thunderbird sofa. Revised and modernized with contemporary comfort, straightened interior back pillows, and conventional seating, the Thunderbird is a statement piece with rich history lavished with mid-century modern elements and styling. While the v-shape cushions of the original design gave the sofa its futuristic look, they aren’t compatible with current-day consumer needs for support and comfort. The cushions are now squared and more substantial to provide better back comfort for hours of lounging. One of the hallmarks of the Thunderbird Sofa is that it combined brilliant style with bright colors printed on a nylon fabric called Astrolon. Astrolon is long gone from the world of fabric, so we’ve selected fabrics that reflect the textures and colors that were popular when the Thunderbird was first introduced. 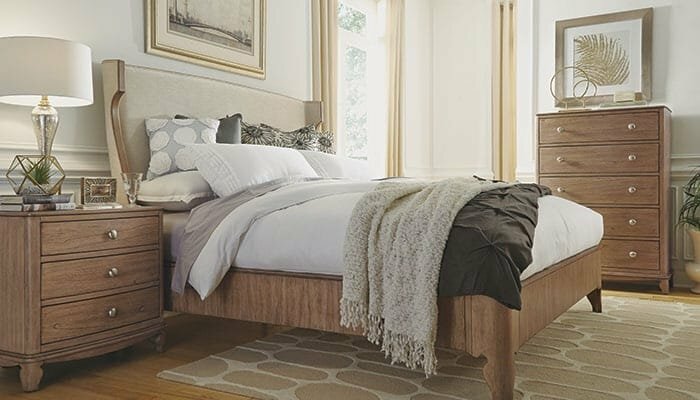 Ask your local retailer for more information regarding availability because this is a piece of furniture you just have to see in person. Flexsteel Celebrated 125 Years in Business! We are celebrated with the Built for Life Sweepstakes!